Rafting and kayaking on the rivers is a terrific summer sport. There are services available that will take you and your group out, or you can go out on your own if you prefer. Be sure you know the class for the stretch you plan to take. There are five classes of river (a class five being virtually un-runnable) and all exist throughout the area. 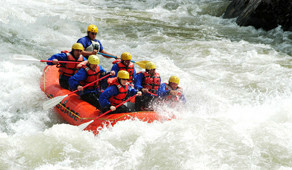 The whitewater adventure season normally runs from late spring to early fall and is determined by the level of river flow. The Cabarton section of the North Fork of the Payette River offers a milder float and is particularly good for wildlife viewing. For the more adventurous, the Lake Cascade Recreation Area offers some of the best whitewater rafting, canoeing and kayaking in the country. Kelly’s Whitewater Park in Cascade is the first of its kind in Idaho, attracting kayakers, canoers, rafters, tubers and standup paddle boarders. The park stretches 1800 feet along the Payette river as it flows past the site of the old Boise-Cascade Mill. The park also features a 2,660 square-foot welcome center that showcases a different theme each year and is also home to the John Borbonus war memorial, the only one if it’s kind in the country.